As the next agricultural revolution unfolds, an increasing number of investors are stepping up to fund it. As recently as six years ago, only three investment funds were dedicated to investing in agriculture technology innovation. Today, there are 13 dedicated to the sector and many more investing as part of a broader portfolio. Here is a deep dive into how the key players emerged, the broader investor base, and what needs to happen from a funding standpoint to continue to grow successful agtech companies. Entrepreneurs from a wide range of disciplines are innovating at a pace never seen before in the industry. The last time the agriculture industry took strides like this was the green revolution of the 1930s to 1960s, which followed the advent of machinery on the farm in the mid-1880s. Today, a wide swath of technologies like robotics, mobile, imagery, and sensors are emerging at the same time as breakthrough science in genetics and microbes, all hoping to disrupt the status quo, and bring agriculture into a new age. As in any industry, innovation is expensive and there is an ecosystem of investors coming together to support the startup businesses that are bringing these new technologies to the market. These investors can be split into a few categories: agritech-focused funds, strategic venture arms, sovereign wealth funds, impact investors, mainstream tech VCs, high net worth individuals, and early-stage resources such as accelerators. The number of unique investors supporting the industry has continued to accelerate. During the first half of 2016, 425 individual investors took part in agtech venture rounds, a 52% increase on the first half of 2015, according to AgFunder data. It’s promising that the industry is attracting new capital, but there is still some way to go for the ecosystem to be self-sustaining. Here’s a look at the evolution of the funding landscape and some ideas on the next best moves for the funding industry to take to support the next agricultural revolution. The first main wave of agritech funds launched in 2006 and by our count, today there are now 13 core firms that have raised funds totaling $1 billion. Even in such a small group, they are spread across Canada, US, Europe, Israel and India, and not all of the funds to-date have focused exclusively on food and agriculture, some have emerged from life sciences or healthcare funds. The first agriculture venture capital funds focused on biotech, with agriculture as one of the sectors served. These were Canada-based Avrio Capital, which raised a $75 million fund, and California-based Finistere Ventures, which raised a smaller fund of $32 million. One of the only other agritech funds to launch before 2011 was Cultivian Ventures, started by ex-Dow AgroSciences veteran Ron Meeusen and life science veteran Andy Ziolkowski, which closed a $34m fund in 2008. “It was pretty lonely out there for a while,” says Cultivian’s Ron Meeusen. Then change happened. Between 2011 and 2015, seven new firms entered the space globally and three firms raised follow-on funds, including Cultivian’s Fund II, which closed on $114 million. So far in 2016 alone, there has been a wave of fundraising activity, with three firms announcing fund closures: Anterra Capital closed its first fund on $125 million, which is the largest agritech fund on record (alongside S2G Ventures); Avrio’s third fund closed on $110 million, and alternative protein-focused New Crop Capital closed on $25 million. In addition, Pontifax Food and Agriculture Technology Fund (Pontifax AgTech) announced the first close of its growth fund targeting $200 million; Finistere held the first close on its second fund; and we at AgFunder are launching a new agritech fund, initially targeting $20m. Outside of the US, China-based Tsing Capital announced plans to raise a $500 million food and agritech fund focused on Australia, and India-based Omnivore Partners is raising its second fund later this year targeting $70 million. There are others on the US agritech scene that are focused on food but have an overlap with ag, such as the newly-launched Powerplant Ventures. In addition to the increasing number of dedicated, agritech-focused investors in recent months, we’ve witnessed the launch of at least 12 new accelerator programs with a focus on the sector. All of this excludes funding activity by governments, corporates and corporate venture arms, private-public partnerships, and smaller regional funds. 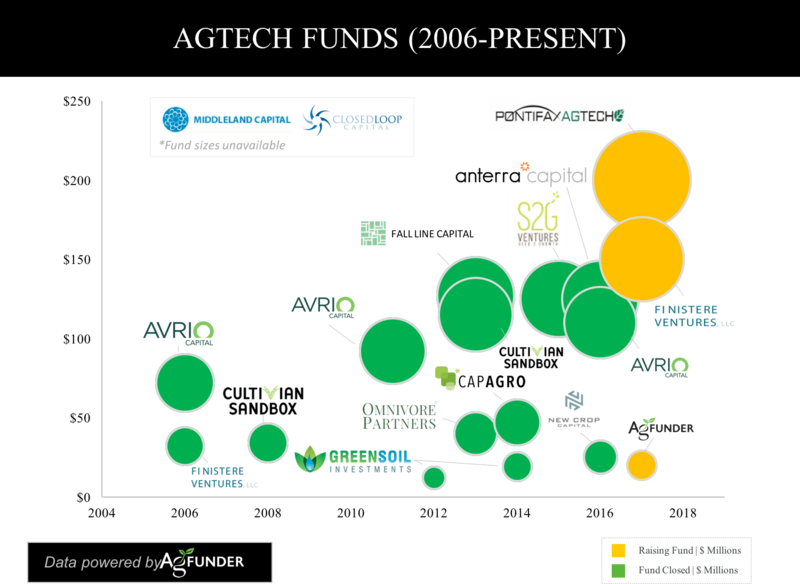 Who is backing agritech VC funds? The funds’ investors — their limited partners (LPs) — are largely from the agriculture industry, and including large agribusinesses looking to augment their research & development departments via venture capital. Families with links to agriculture and those with impact and sustainability agendas have also invested. Two of the earliest agritech firms — Cultivian Ventures and Finistere Ventures — were backed by Monsanto and Bayer, respectively, as those agribusinesses’ first forays into the startup space. Anterra Capital’s LPs are Rabobank and Eight Roads — part of the Fidelity Group — and Middleland Capital and Closed Loop Capital are both backed by family offices. Some of these large strategics went ahead and created their own in-house corporate venturing arms, straddling the line between corporate and VC and creating another investor category for the next agriculture revolution (see below). To date, few of the agritech funds have raised funding from the more mainstream pension funds and large institutional LPs that are still on the sidelines looking in. These larger LPs are typically more conservative in nature and often don’t invest in new or emerging managers, or new sectors. Syngenta was the first to launch a corporate venturing arm, dating back to 2006, with Monsanto joining in 2011 with the creation of Monsanto Growth Ventures (MGV). MGV and Syngenta Ventures are by far the most active, but their peers BASF, DuPont, and Bayer have started agritech investing initiatives too. Smaller agriculture companies are also joining the ecosystem either by making investments into these managed funds, through their own dedicated corporate venture arms or through direct investments. The Andersons, for example, created Maumee Ventures in 2015 and ag-retail firm Wilbur-Ellis is now creating a corporate venturing arm called Cavallo Ventures. Food companies are also joining the fray, such as Campbell’s Soup, which recently invested in Acre Venture Partners as its sole LP. The motivation and priorities of these corporate venturing arms often differ from independent venture firms, not least in the time frame they have to hold investments and their thematic focus. Some impact investors have played a role in funding the sector, namely the Bill & Melinda Gates Foundation, which last year invested in AgBiome but is also partnering with the biological inputs company on further research. Some of the agritech VCs call themselves impact funds, such as Closed Loop Capital and Omnivore Partners. There are new impact-focused food and agritech funds launching in the near future as there is clear potential for agriculture technology to positively impact environmental issues — such as water and soil degradation — and also have a social benefit particularly in developing nations where agriculture employs a much larger portion of the workforce. There is big potential for impact investors to play a larger role in supporting the next agricultural revolution, and we expect to see this part of the investor universe grow. Mainstream investors have supported the agritech sector through direct investment from the beginning. This support can be sporadic, however, which casts some concern on how reliable a funding source they are. In 2010, the Wall Street Journal reported 11 agritech deals closed in 2009 up from 5 in 2000, giving the sector an average of 6 deals per year over that time frame. With very few agritech VCs in the market, it was a broader array of investors funding these deals, from venture capital funds, to family offices and other financial investors. A few of the more traditional tech venture capital firms, namely Kleiner Perkins Caufield & Byers (KPCB), Khosla Ventures and Andreessen Horowitz were funding more of the tech-centric plays, while some of the life science VCs backed agricultural biotech deals, but overall it was mostly opportunistic investors funding the space. Fast forward to today and that has continued; there is now a long tail of investors who are placing tangential bets on agritech by making investments in drones, sensors, satellite imagery and more. There’s been a particular surge of interest in the earlier stages of agritech innovation. With new technologies that are now economically viable for the sector and a large amount of scientific research not commercialized, many folks around the world see that they have unique assets to contribute. In the first half of this year, at least 12 new agritech startup accelerator programs have launched globally and that’s just part of the 70-plus startup resources that are dedicated to agritech – from venture development organizations and incubators to grants and business competitions. Universities and research institutions are still struggling to get up-to-date with tech transfer to help their graduates commercialize their discoveries, but some of these new resources are hoping to change that, such as the Ag Innovation Development Group out of Tennessee, AgTech Accelerator at Research Triangle Park and AgStart near UC Davis. Even generalist accelerators, or those from other industries, have stepped in to bridge the early stage funding gap with some playing a vital role. During the first half of this year, the self-dubbed “Accelerator VC” SOSV invested in 26 agritech startups through its IndieBio and Food-X accelerators in San Francisco, Ireland, and New York. This one VC represented 16% of seed stage deal activity. It’s still unclear how all of this will play out among early stage agritech participants or how impactful these resources will be, but it’s recognized that agriculture’s unique and complicated characteristics merit help at the earlier stages. The future of the agritech funding market is unclear. There are still gaps in funding, particularly at the later stages of an agritech startup’s development. There are a few dedicated agritech growth stage funds that are launching, but more often the mainstream VCs are stepping in to lead rounds beyond Series B stage. However, this may leave agritech startups exposed given that generalist VCs are not always reliable. 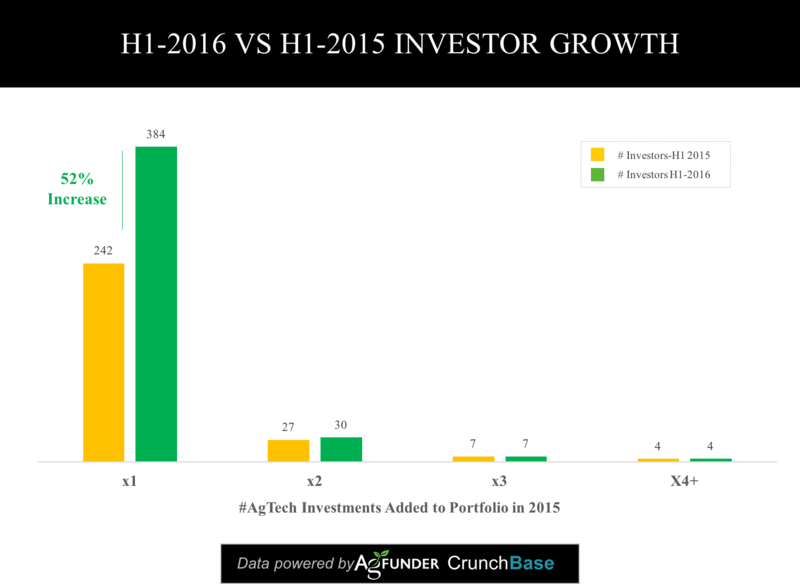 Khosla Ventures, for example, invested in 10 funding rounds for eight different companies in 2014, but in 2015 it made just three agritech investments, and so far in 2016, it’s made one. Kleiner Perkins was another top 5 active investor in 2014 with five agritech investments, but this year has just re-upped on existing portfolio company Farmer’s Edge. This pullback from these funds doesn’t mean agritech is out of favor with them, but reflects the fact that fund priorities ebb and flow along with innovation and industry development. The industry will likely always have mainstream VCs participating, and that funding is important right now to help spur agtech development and help with the capital to increase return profiles. We still need more capital and investors coming into agritech, particularly investors from around the globe. Agriculture is a global industry, so a globally diverse investor base will be key to help agritech companies scale. What do you think? Are you funding the next agricultural revolution? We want to hear from you! Email [email protected]. A version of this article originally appeared on Forbes.com. Hi I am looking for an Investor who can fund our agricultural farming here in philippines. thank you..
How can I access finding for agricultural machinery that can help in boosting food production in Africa? we have lots of potential in agribusiness in kenya but how do i get an investor to provide capital for bee keeping,avacado farming, fish farming,poutry ,wheat ,oranges and strawberry? this are areas which have largely not been tapped .